By: Ramzi Ali, Sri Lanka and Surinder Jain. The Ramayana is an ancient Hindu epic of India, the life of Lord Rama, an incarnation of God Vishnu. In the story Rama’s wife, Sita, is kidnapped by the evil demonic (Asura) king, Ravana, king of an island to the south of India, Lanka. Now known as Sri Lanka, a number of temples and other places associated with events narrated in Ramayana have been discovered and a tour of all such places can be made in “Ramayana Trail of Sri Lanka”. Incredibly, the names of places have come down to modern times unchanged. Though great social, cultural and religious changes have taken place in Sri Lanka ever since. People of Sri Lanka from generation to generation believe that King Ravana ruled this country. There are many traditions and legends, which seek to explain the origin of place names by connecting with stories derived from the Ramayana. They are found in several parts of the island. Some of them are named after Rama, Ravana and Sita . Tour guides have expressed the emotional feelings of the Lord Rama devotees when they visit this temple. Saint Shri Morari Bapu from India visited Sri Lanka in August last year for the second time. To listen to his “Ram Katha” nearly 1,200 of his devotees visited Sri Lanka. There is much legendary evidence. For example, people believe that Thiru Koneswaram in Trincomalee was constructed by God Shiva for the devotion of King Ravana. The hot wells at Kanniya were constructed by King Ravana. According to Ramayana, King Ravana brought Sitadevi from India in a “Pushpakavimana” which is widely known in Sri Lanka as “Dandu monara yanthraya”. Is a tourist attraction, is located in a setting of superb natural beauty. It is surrounded by hills covered with thick vegetation. Local tradition claims that the Hanumanji found Sitadevi at this place. Weragantota, means a place of aircraft landing in Sinhala language, is believed to be the first place where Sitadevi was brought into Lanka in King Ravana’s Vimana. There was an aircraft repair center in the capital city. This place is known as Gurulupotha. In Valmiki’s depiction King Ravana’s vimana resembled a huge peacock. The Vimana in Sinhala language means Dhandu monara which is known as flying peacock, and hence the name Gurulupotha, which means parts of birds. The jungles are the place where the city of Lankapura once stood .The city had a beautiful palace for queen Mandothari surrounded by waterfalls, streams and varieties of flora and fauna. Sitadevi was kept in this palace until she was moved to Ashoka Vatika. The remains that are found are the remnants of later civilizations. This place is now called Sita Kotuwa which means Sita’s fort and got its name because of Sita devi’s stay here. Naga deepa An Island Situated in Northern Jaffna Peninsula. Lord Hanuman was tested by Surasa devi the mother of naga’s for his valor and intelligence. This island is now known as Nagadeepa and consists of a Amman temple and a Buddhist shrine. The jungle on the top of Pusselawa Hills The place where Lord Hanuman first set his foot on Lanka. These hills stand tall in-between King Ravana’s capital city and Ashoka Vatika. The barren land here is believed to be the route in which King Ravana took Sitadevi from his capital city Lankapura to Ashoka Vatika, which was a paradise on earth. Till date no vegetation grows on this passage except grass. King Ravana is believed to have taken this passage on top of these hills to show Sitadevi the beauty of his kingdom. There is a pond found on the Chariot Path en route, is believed to have been formed by the tears of Sitadevi and has not dried up since, even during severe droughts when the adjoining rivers dry up. Sita flowers In this area there are many large trees whose bright red blooms add colour to the scenery. These flowers are called Sita flowers. The peculiarity of these flowers is the configuration of the petal’s, stamen and pistil’s, which resemble a human figure carrying a bow, and is said to represent Lord Rama. These flowers are unique only to this area in the whole of Sri Lanka. On these hills of Ramboda where Hanuman was searching for Sitadevi, Chinmaya mission of Sri Lanka built a temple with Hanuman as the presiding deity. On every full moon day special pooja’s are conducted and witnessed by thousands of devotees. This temple is called Sri Baktha Hanuman temple. The image of Lord Hanuman here is 16 feet. Sita Pokuna the dried pond area situated on the top of Haggala Rock jungle. The barren piece of land in the midst of the jungle is the place where Sitadevi was kept captive is called Sita Pokuna, which means Sita’s pond in Sinhalese. It is believed that a pond existed at this site during the captivity of Sitadevi. Local folklore says it is after Sitadevi left this place the pond dried up and till to date no vegetation grows on this particular piece of land, surrounded by dense forests on all sides. This temple was recently renovated and a special pooja was held on 28 January 2008. Nearly 200 Indians attended this special pooja. The stream that runs from the hill, catered to the needs of Sitadevi during her stay at Ashoka Vatika. She is said to have bathed in this stream. Now there is temple for Lord Rama, Sitadevi, Luxshmana, and Hanuman by the side of this stream. It is interesting to note that foot prints akin to Lord Hanuman’s are found by this river and some are of small size and some are of large size, which tells us of the immense powers of hanuman transforming himself into any size. This is a rock in the Labukalle estate. Lord Hanuman met Sitadevi. and on his way to announce this happy information to Lord Rama, rested on this hill top. The hill where Lord Hanuman is believed to have rested after meeting Sitadevi is known as Mani kattuther. Today an open temple with statues of Lord Rama , Sitadevi, Lakshmana and Lord hanuman stands on top of it . Locals visit the temple often. According to Ramayana, after meeting Sitadevi Lord Hanuman decided to test the strength of the mighty King Ravana and his army of Rakshasas. In the events that unfolded Lord Hanuman’s tail was set on fire by the rakshasa’s , who in turn went on to torch some parts of King Ravana’s empire. Ussanggoda is one of the torched areas, which is said to have been an airport used by King Ravana. This area still holds the blackened, burned scorched effect as a reminder of Lord Hanuman’s escapade. It is also evident that the adjoining surrounding area has plant life. Its soil is all together of a different colour. This is situated on the Southern Coast. Ishtripura means an area of women in Sinhalese. This was one of the places to which King Ravana shifted Sitadevi as a precautionary measure which he was forced to take by Lord Hanuman’s advent. There are lots of intruding tunnels and caves in this area. This seems to be a part of a great ingenious network of paths, which is interconnected to all the major areas of King Ravana’s city. Sitadevi took bath in this very stream and had dried her hair sitting on a rock and put clips to her hair, hence this rock is known as Konda Kattu Gala. This is situated in the Welimada Area. It is a place where Sitadevi stayed during her transit. This area is also linked with tunnels and caves, which runs through to other parts of King Ravana’s kingdom. This is situated in the Kotmale area opposite to Ramboda rock. Gayathri peedam is believed to be the place from where King Ravana’s son Meghanath propitiated Lord Shiva with penance and pooja’s and in turn was granted super natural powers by Lord Shiva. This is the first and the foremost temple built for Gayathri Amman in Sri Lanka, and the Shiva Lingam found in this temple was brought from the holy river Narmada. This is situated in the Nuwaraeliya town. Situated in the Northern Jaffna Peninsula. When Lord Rama’s army entered Lanka they took positions on different sides to attack King Ravana and his army. The army that was situated on the northern side faced a severe water crisis. Lord Rama at this juncture shot a powerful arrow into the ground and water sprung out immediately. Till date there is a well situated at this very spot called Nilawarai in Puthoor. It is a fact that this well has never dried up and caters to the needs of the local folks even during severe droughts. The southern most part of Sri Lanka is called Dondra and further up towards west is called Seenigama Hikkaduwa. 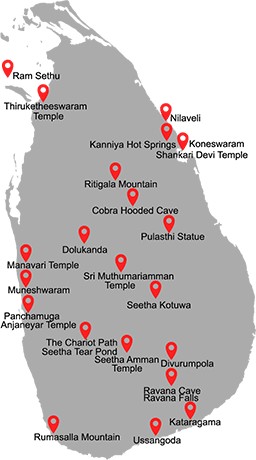 These are the places from where Sugreeva king of the Vanara’s started his onslaught on King Ravana’s forces. An interesting as well as shocking episode took place here. To shatter Lord Rama’s confidence and halt his progress during the war, Indrajith eldest son of King Ravana played a trick, with Sitadevi’s look alike. Indrajith beheaded the look alike in front of Lord Hanuman thinking that it will stop the advancing forces of Lord Rama. There is a stone in this area called “Rampathagala” with one foot mark which is traditionally believed by the people as Lord Rama’s foot mark. This place is known as Sita Waka and situated close to Avissawella. Yudhuganawa is situated in the midst of the jungle called Wasgamuwa. It is said that this particular piece of land can never bear any vegetation as this served as the battlefield and had borne the brunt of destruction. World’s end or Pathala Lok is the place where Mahi Ravanan had hidden both Lord Rama and Lakshmana who were later rescued by Lord Hanuman and brought them back carrying them on his broad shoulders. This is situated at Horton Plains close to Nuwara Eliya. At different points of time during the war both Lord Rama and Lakshmana were hit by powerful arrows, fell unconscious and to bring them back to life Lord Hanuman was instructed to fetch the life saving herbs from Himalaya. Hanuman went to the hill, lifted the whole hill and brought it, as he was not able to identify the life saving herbs alone. Parts from the hill fell on five places in Sri Lanka, namely, Rumasala in Galle, Dolu Kanda in Hiripitiya , Ritigala on the Habarana Anuradhapura road, Thalladi in Mannar and Kachchativu in the north. In the Matale district on the out skirts of Wasgamuwa National Park. Dunuwilla is the place from where Lord Rama fired the brahmaastharam at King Ravana, which eventually killed him. Dhunu means arrow and Vila Means Lake. This place got its name because Lord Rama fired his arrow from this lake. The cartels behind the Dunuvila lake are called Laggala which when translated into English gives us the meaning target rock. Laggala served as a sentry point to the King Ravana’s army and it was from this rock the first Glimpse of Lord Rama’s army was sighted and informed to King Ravana. This hill is geographically the highest part of the northern region of King Ravana’s city and on a clear day the north east side that is Thiru Koneshwaran and north west side that is Thalai mannar could be seen even today. King Ravana is believed to have done meditation on this rock and prayed Lord shiva at Thiru Koneshwaran from this point. It is situated in the South East of Sri Lanka. This is the temple of Lord Karthikeya Subramaniam at Kataragama. Lord Karthikeya was requested to go to the battlefield by Lord Indra on the last day of war. This was done to protect Lord Rama from the wrath of Brahmasthra aimed by King Ravana which other wise would have weakened Lord Rama. The benefit was one of the most powerful weapon brahma asthra aimed at Lord Rama for the second time was rendered useless by the presence of Lord Karthikeya. This is situated in the Mahiyanganaya – Wasgamuwa road. King Ravana’s body after his death was kept upon this rock Yehangala meaning bedrock. His body was kept here for his countrymen to pay their last respects to their dear departed king. Geographically this rock is visible from miles away on its 3 sides Divurumpola It is situated 20 Kilometers from Seetha Eliya on N”eliya Welimada road. means a place of oath. Sitadevi, after her liberation from King Ravana underwent a test to prove here chastity by offering herself to fire. However she came unscathed and proved here holiness. On the Polonnaruwa – Batticaloa road about 20 kilometers from Batticaloa. Vantharumulai in Tamil means “corner where they came and rested “. It is believed that Lord Rama, Sitadevi, Lakshmana and Lord Hanuman rested at this place after the turmoil’s of the war. Today the Eastern University is situated at this place. It is situated in the Batticaloa town. Amarnthakali is believed to be the place where Lord Rama, Seethadevi and Lakshmana had their first meal after the ravages of the war. There is also a lake at this place known as Hanuman Lake or the old lake, which served to extinguish the fire set on lord hanuman’s tail. Today their exists a temple for Kali Amman , Lord Shiva and Lord Ganesha. Kelaniya is situated about 10 km from Colombo on Colombo – Kandy road. Kelaniya is the place where King Veebeshana ruled after being crowned by Lakshmana. As Lord Rama was in exile for 14 years, could not take part in any coronation ceremony, deputed his younger brother prince Lakshmana to crown Veebeshana. Today in this very place a Buddhist shrine and a temple for king Veebeshana exist. There are murals enshrined outside the Buddhist temple depicting the crowning of King Veebeshana. Today temples for King Veebeshana are found through out Lanka and he is still considered as one of the 4 guardian deities of Sri Lanka. A painting of King Veebeshana adorns the walls of the new parliament. It is a fact that there is no temple for King Ravana where as many exist for King Veebeshana. This goes on to prove that his stand towards dharma and justice made him a god is Sri Lanka. About 12 kilometers from Chilaw town on Colombo-Puttalam road. Lord Rama after his victorious battle left for Ayodhya in one of King Ravana’s vimana’s. He felt he was being followed by bramhaasthi dosham as he had killed King Ravana who was a Brahmin. He stops the vimana at this juncture because he felt at this place the “Brahmaasthi Dosham” was not following him. He ascends from the vimana and asks God Shiva for a remedy. God Shiva blessed Lord Rama and advised installing and praying four lingams at Manavari, Thiru Koneshwaram, Thiru Ketheshwaram and Rameshwaram in India, as the only remedy to get rid of the dosham. Manavari is situated on the Chilaw – Puttalam road about 10 km from Chilaw. Manavari is the first lingam installed and prayed by Lord Rama and till date this lingam is called as Ramalinga Shivan. Rameshwaram is the only other lingam in the world named after Lord Rama. This temple is situated in the Trincomalee town. On his return Lord Rama stopped at this place to reach Thiru Koneshwaram. He rested his bow on the ground here. Bow meaning vil and Undri meaning resting, in Tamil gave this place Vilundri its name. This temple is situated in the Trincomalee town. Thiru Koneshwaram was built by sage Agasthyar as per the instructions of Lord Shiva who was impressed by the devotion of King Ravana. This place has the uniqueness of the lord building a temple for his devotee as a reward for his devotion. Lord Rama also offered his prayers on his return to get himself rid of the Brahmaasthi dosham. This is situated in Mannar. Thiru Ketheshwaram is the third Lingam in Lanka, which was installed and prayed by Lord Rama to get rid of the Brahmasthi dosham. This is situated in the Eastern Coast of Ampara. Thirukovil is the place where King Ravana mother’s palace stood. The whole place was submerged, and a temple has been built on the shores now. This is situated in about 10 km from Trincomalee town on the Trincomalee – Anuradhapura road. Kanniya is the place where King Ravana carried out the last rites for his mother. When he was not able to find water to perform his rites, he in sheer anger pierced his trishul on the ground seven times, and water started gushing out immediately. It is believed that the anger of the king subsided on seeing the water and similarly the warmth of the water also reduced. The temperature of the water is different in all the seven wells. This is situated at Harasbedda on Nuwera Eliya – Walapane Road. King Ravana had his dairy farm here. Milk was air lifted to the capital Lankapura from here using Vimana’s. The stone pillars here has the worn out marks cast by constant use of tying ropes on them. Kondakalai like many other cities and villages in Sri Lanka also derives its name from the Ramayana, when King Ravana took Sitadevi in a chariot to ashoka vatika her hairs got de ranged because of the speed of the chariot. Konda kalai in Tamil means deranging of hair. Till date the villagers live with legacy of this event. About 9 kilometers from Colombo central at No 3/11, Sri Bodhirukkarama Road, (Vihara Lane) Kalubowila, Dehiwela A temple dedicated to Anjaneyar temple in Sri Lanka. The only temple in the world to have a chariot for Anjaneyar. The chariot festival is held annually end Dec/ beginning of January. Airports of Lankapura Researchers have found out more than 5 airports believed to have been used by King Ravana and his mighty army to land and take off their vimana’s. These Vimana’s were used as goods and passenger carriers. Identified airports are Weregantota in Mahiyangana, Thotupola Kanda at Hoton Plains, Usangoda on the Southern Coast, Wariyapola in Kurunegala and Wariyapola in Matale. These tunnels prove beyond doubt the architectural brilliance of King Ravana. These tunnels served as a quick means of transport through the hills and also as a secret passage. These tunnels networked all the important cities, airports and dairy farms. A close look at these tunnels indicates that they are man-made and not natural formations. This Buddhist shrine at Kalutara was where once King Ravana’s palace and a tunnel existed. Existing tunnel mouths are situated – Isthripur at Welimada, Ravana cave at Bandarawela, Senapitiya at Halagala, Ramboda, Labookelle, Wariyapola/Matale, and Sitakotuwa/Hasalaka. In addition there are many more tunnels. Maha Ravana guda in Sinhala means great Ravana fort, is one of the 25 palaces built by King Ravana. The palace was submerged and a lighthouse was built on this place. The place retains the name till todate. These places are accessible by boat from Kirinda. After King Ravana’s death, the naga tribes were grief struck and were not able to accept the reality of the death of their beloved King. They took King Ravnans’s body into the jungles and tried to give life with their mystical powers. As they could not bring him back to life they mummified his body and hid it in a cave. It is a belief in Sri Lanka that King Ravana’s mummy lies hidden some where in these hills. It is somewhere within the range of Harasbedda, Ragala, Walapane mountains.